German speaking guide in Krakow needed? English language is not only the one that you can hear in Krakow. We offer guided tours in 8 languages – German, English, Swedish, Russian, French, Spanish, Italian and Polish of course. A significant percentage of our guests are German-speaking groups, which is why we are particularly proud of speaking in the language of Goethe! A propos, did you know that Johann Wolfgang Goethe visited Krakow in 1790 and stayed in house, that is still standing at the Market Square? Learn more about our Krakow tours in German! 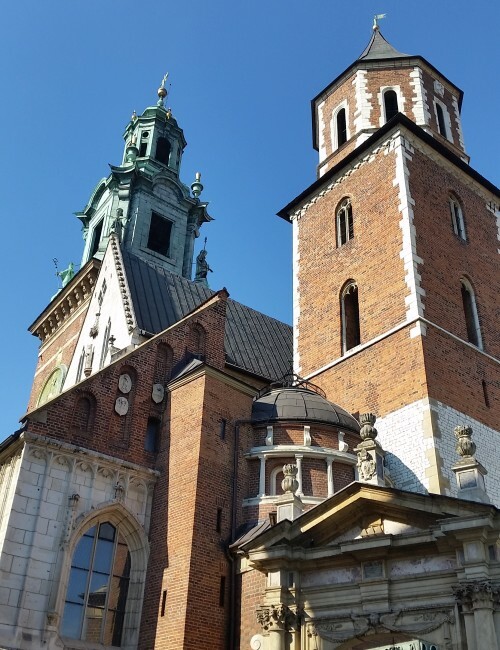 Do you need Krakow sightseeing with a German-speaking guide? Feel invited! Why us? Because our professional guides, Monika and Bozena speak German as they were native! Moreover, they are willing to show your family, friends or business groups from Germany, Austria and Switzerland all the wonders of Krakow and the surrounding area. Even if your guests know English very well, it is always nice and more comfortable to them to listen stories about Krakow in their native language! So it is obvious that German-speaking guide in Krakow is the perfect solution! We offer Krakow guided tours in German language on all available routes. Take a look at our home page and see how various and inexpensive are our services. Fantastic tours lead by a German-speaking guides through the Old Town, Kazimierz, Podgorze, Zabłocie, Nowa Huta and trips to the suburbs of Krakow (Tyniec) or closer and further Krakow sourroundings (Wieliczka, Ojców National Park, Auschwitz Museum, Wadowice, Kalwaria Zebrzydowska). We also have a special offer for children, adolescents and pilgrims. Of course our guides are absolutely wide open to new ideas, suggestions and wishes. We are helpful in any advices at the planning stage of your trips and organizational support, trying to work out the ideal concept of your stay in Krakow. Speaking many languages and being very hospital are our pride! Krakow tour in German? No problem!